Overview - Two narratives -- the life cycle of a mother walrus and her calf, and the life of a polar bear and her cubs -- are used to illustrate the harsh realities of existence in the Arctic. It may come as a surprise to a generation raised on those cute and cuddly Coke commercials, but the polar bear is in fact the most vicious species of the genus ursus. It's true -- try to get close enough to one of these creatures to give it a hug, and it won't think twice about ripping your head clear off. Not that you'll learn this from 'Arctic Tale.' As the latest documentary from filmmakers Adam Ravetch and Sarah Robertson, the talented team behind 'March of the Penguins,' I expected excellence on the level of that box office smash, which gave family audiences the cute creatures they expected, but at the same time didn't pull punches in depicting the often harrowing day-to-day realities that penguins face in the wild. Instead, in 'Arctic Tale,' we get little more than endless shots of an undeniably cute polar bear family and a bucket load of surprisingly sophomoric humor. 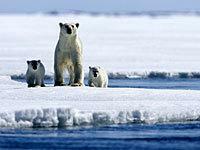 Like 'Penguins,' 'Arctic Tale' was shot over many, many years, during which Ravetch and Robertson and their team tracked a polar bear cub named Nanu from pup to adulthood, photographing him and his family entirely in their natural habitat. And just like 'Penguins,' the footage they obtained is truly fantastic. Often risking life and limb, the filmmakers were somehow able to capture the natural rhythms of the animals without disrupting them, and it's edited together so seamlessly that it almost seems as if we're watching trained circus performers, not untamed polar bears who don't look too kindly on human intrusion. The story further deviates from a simple tale of brave polar bears with a none-too-subtle political agenda of global warming. As the narration (co-written by Kristen Gore, Al's daughter) gravely intones, the polar ice caps are melting, which is certainly true, but the attempt to add a ticking clock to the story feels forced and phony. I know that global warming is a serious and important issue, but here it only takes the focus away from what we paid to see, which is the animals and their lifecycle. By the time the end credits role (when 'Arctic Tale' trots out a group of children hawking various tips on how mom and dad can save us all from global warming) it all becomes terribly and uncomfortably didactic. But what I found most disappointing about 'Arctic Tale' is that much of the tone of the narration (voiced by Queen Latifah) is shockingly low brow. The lame euphemism used for some of the animal's sexual proclivities is a bit tacky, and is only outdone by the juvenile focus on excretory functions (there is even a montage of various creatures farting). One of the things I liked so much about 'Penguins' was that it took the high road, and didn't give in to the popular mindset that children can't be entertained and enlightened without cheap sight gags. It may sound like I'm being a bit hard on 'Arctic Tale.' To be fair, there is a wealth of wonderfully-shot documentary footage, and many moments of illumination about the lives of polar bears and walruses. That's why I'm still giving the movie three stars, because it delivers on the bottom line -- you want cute polar bears, you got 'em. But coming after 'March of the Penguins,' I just expected more. Here's hoping that whatever subject Ravetch and Robertson choose to take on for their next project, they find a better story around which to organize their fantastic footage, and skip the sophomoric humor. 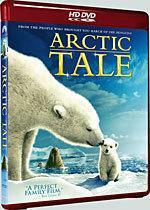 'Arctic Tale' was shot over many years with a variety of film stocks and video formats, making this 1080p/AVC MPEG-4 transfer something of a hodgepodge. It's very tough to judge a presentation of source material this erratic and inconsistent, but to Paramount's credit they've not overcompensated with a lot of post-production tricks, so at least 'Arctic Tale' remains natural-looking and generally pleasing. 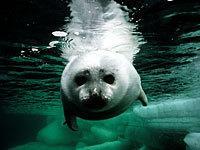 As you would expect from a nature documentary shot in the arctic, lighting conditions varied greatly during the shoot, leaving black levels all over the place. Some shots are quite striking and well detailed, while others are either too dark or washed-out. Again, the transfer itself has not been overly processed to compensate, so it never feels artificial or "digital." Film grain and blemishes are rampant, however, so expect wild inconsistencies from scene to scene and sometimes even shot to shot. Colors are pretty well saturated all things considered, although the video-based footage can be quite poor at times, with very flat and bland hues. Brighter scenes excel, however, boasting moments that approach the better IMAX presentations I've seen on high-def. My only real complaint with the transfer itself is that some edge enhancement has been applied to maintain sharpness, so edge halos are visible throughout. Aside from this, and especially considering the source, 'Arctic Tale' looks pretty darn good, and is certainly more than watchable. Paramount presents 'Arctic Tale' in Dolby Digital-Plus 5.1 Surround only (1.5mbps), but given that this is a documentary that's almost entirely composed of rough on-location sound, the lack of high-res audio is no huge disappointment. To be sure, this movie is just not about sonic thrills, so expect a largely stereo mix with a bit of oomph added thanks to the score. The soundtrack is all front-heavy. The narration by Queen Latifah is front and center as it should be, and it's a polished recording that's nicely balanced with the rest of the mix. The folksy songs and score by Joby Talbot, although not overpowering (and sometimes even minimal), are warmly rendered. There is only a bit of bleed to the rears, but given the material, that's appropriate. The rest of the track is all location sound, which is almost always hampered by the physical conditions of the shoot. Still, it's to this soundtrack's great credit that even played back at a pretty high volume, I was not bothered by screechy highs or badly balanced effects (this is not often the case with documentaries). All in all, a pleasing presentation of some very difficult material. Featurette: "The Making of 'Arctic Tale'" (SD, 23 minutes) - This straightforward making-of excels simply because of the arduous nature of the film's years-long production. It is both fascinating and terrifying to watch, as the seemingly tireless team of filmmakers brave unimaginable physical conditions and the threat of polar bear attacks to capture the necessary footage. Featurette: "Polar Bear Spotting" (SD, 6 minutes) - An addendum to the "Making Of," this excerpt from the 'Are We There Yet? World Adventure' series gives a little how-to for thrill seekers interested in making their own expedition to the wilds of the arctic in search of polar bears. No thanks! Theatrical Trailer (HD) - The title says it all, but note that this is the only extra on the disc presented in full 1080p/MPEG-2 video. 'Arctic Tale' is another documentary from the makers of 'March of the Penguins' about our fuzzy animal friends up north. Unfortunately, however cute polar bears and walruses might be, 'Arctic Tale' just doesn't have the same emotional pull as 'Penguins' (although much of the footage captured is magnificent). This HD DVD release pretty good. The quality of the video and audio holds up considering the source material, and there are a couple of informative featurettes. Still, it's hard to recommend 'Arctic Tale' to anyone but fans of the nature documentary genre, or those who just can't get enough of polar bears.